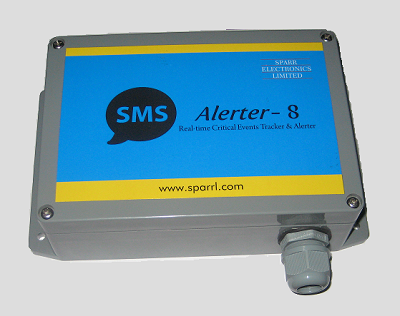 SMS Alerter – 8 can be used for sending critical alerts to 5 mobile numbers stored in its memory, so that the required concerned person can take immediate remedial actions thereby preventing any major incidents and increase productivity. There is flexibility to the user i.e, the 8 Inputs or Outputs are factory configurable so that any combination of them are possible. The unit is housed in IP65 plastic enclosure to withstand demanding environmental requirements. Remote Monitoring of locations / Services.